These statements were made by residents on Chicago’s South Side , but they could have been uttered by residents from any number of Black neighborhoods across the country. It has long been voiced at the community level that Black neighborhoods have disproportionate densities of fast food restaurants. And research studies have consistently supported these claims . A 2004 study conducted in New Orleans looked at the relationship between fast food density (the number of restaurants per square mile in shopping areas) and the percentage of Black residents. They also looked at the effect of neighborhood income. Only the percentage of Black residents was related to fast food density, and Black neighborhoods had 6 times as much fast food as White neighborhoods . On the other hand, a study in Atlanta showed that low and high income predominantly Black areas had less access than comparable White areas to restaurants that were not fast food . The fact that this was true for low and high income areas highlights the fact that income is not the driving factor. It is often assumed that if Black neighborhoods have high densities of fast food restaurants, it is because those neighborhoods are lower in income than White neighborhoods, and perhaps fast food companies target lower income customers. But research consistently shows that income is not the only factor. In some studies, race is just as important as income. In others, race is the only important factor. For example, a study in New York City showed that across the 5 boroughs, fast food was prevalent in commercial areas, such as shopping districts, tourist areas, transportation hubs and central business districts (e.g., Times Square, Port Authority, Penn Station, Wall Street). But in residential neighborhoods, fast food was most prevalent in Black and Latino neighborhoods . In that study, the percentage of Black residents was the strongest predictor of fast food density–income was not related. White and Black areas with comparable incomes did not have the same exposure to fast food, and Black areas that were high in income did not have lower exposure than areas that were lower in income. This suggests that fast food location in NYC is about race, not income. In Latino and Black South Los Angeles, a study found that 73% of restaurants were limited service, while only 27% were full service. And, compared to predominantly White West Los Angeles, the community had fewer restaurants overall–half as many, in fact. Finally, only 27% of restaurants in South L.A. used healthy food preparation options, compared to 40% in West L.A. . In a study conducted in several U.S. cities, not only was fast food exposure greater in Black neighborhoods, but exposure to fast food was related to greater consumption of fast food and lower probability of consuming a healthy diet . Indeed, several studies have shown that proximity to fast food is related to greater consumption, higher obesity prevalence, and chronic illnesses such as cardiovascular disease. And, although Black neighborhoods are overabundant in fast food, research also shows that they have less access to supermarkets . It is also worth noting that research also shows Black neighborhoods to have fewer retail stores in general (stores that are not fast food). For example, also in NYC, predominantly Black zip codes had fewer retail stores than White zip codes, and there was less diversity in the types of food service stores. This was true even though Black zip codes had the same amount of retail space and more transit rail than White zip codes . Research at the national level also shows that Black neighborhoods have less retail. Again, the same findings do not emerge for income as for race [10. Below are a few images to illustrate some key points. As stated above, Chicago’s South Side has a high density of fast food. The first map below shows some of the fast food and liquor stores that are in and around the Grand Boulevard neighborhood. No supermarkets operate in the area–the only places to buy food are from food and liquor stores such as Calumet Food and Liquor. 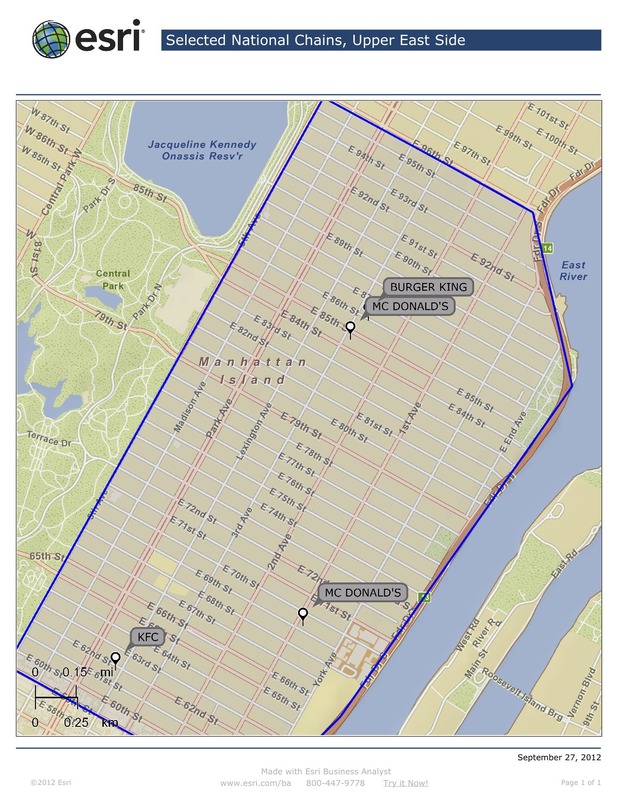 The next set of maps show fast food in Central and East Harlem, compared to the Upper East Side. As can be seen, Harlem has much more fast food, which is what the NYC Department of Health reported in 2007 . The last map compares Bedford-Stuyvesant to Park Slope. 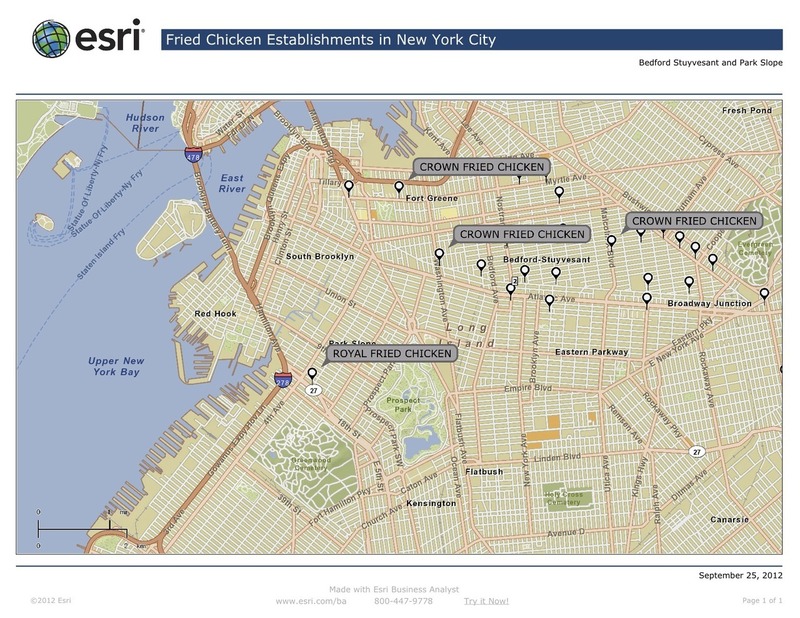 Again, predominantly Black Bed-stuy has more fast food.These maps show both national chains and smaller chains that sell fried chicken. Many of these smaller chains with fried chicken in their name are pervasive in Black communities, whether it be New York, Newark or Philly. In contrast, Starbucks is virtually absent in Black neighborhoods, particularly compared to fried chicken outlets. Density of fast food, Pt. 2. 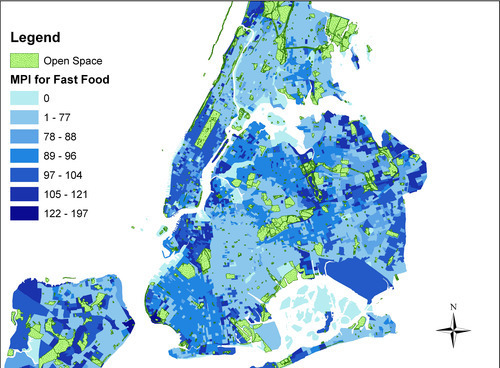 Finally, the map below shows market potential index for fast food in NYC. As was noted above, fast food density is largely not about income. So, what is it about? Many assume that perhaps there is simply greater demand for fast food in Black neighborhoods. But mapping the demand for fast food, according to industry data, shows an opposite picture. In the map, darker areas have greater demand for fast food. The MPI measures demand compared to the national average. The national average is 100. So, a value of 300 would mean a neighborhood has demand for a product that is 3 times the national average. As shown in the map, the areas that are light in color are the places where demand for fast food is the lowest. Those neighborhoods are the Black and Latino neighborhoods in NYC, such as the Bronx, Harlem, Central Brooklyn and southeast Queens. And yet, those are the neighborhoods that have the most fast food restaurants. “365 Black” is described as “a place where you can learn more about education, employment, career advancement and entrepreneurship opportunities, and meet real people whose lives have been touched by McDonald’s. Plus, you can also have a chance to win exciting once-in-a-lifetime opportunities.” The website goes on to say, “Like the unique African Baobab tree, which nourishes its community with its leaves and fruit, McDonald’s has branched out to the African-American community nourishing it with valuable programs and opportunities." Some of the programs/opportunities described on the site include a DJ Flavor battle, a Men of McCafe casting call, an HBCU classics celebration, and a gospel tour. Of course, McDonald’s is not the only fast food company that actively targets Black consumers. KFC uses a similar strategy on their “Pride 360” site, featuring events such as an HBCU homecoming, family reunions, Black College Expo, and a Hitmaker contest, in which contestants were to create songs that “express the signature themes of KFC’s Pride 360 initiatives as expressed in the Pride 360 keywords: Individual, Family, Community, and Heritage…” and “may, but is not required to, make reference to KFC, its heritage and food.” More recently, Mary J. Blige came under fire for singing about fried chicken for a Burger King campaign. Smaller companies, such as the various fried chicken outlets pictured above, may not have major advertising campaigns, but they target Black communities through the number of stores in those neighborhoods. Block, JP, RA Scribner, and KB DeSalvo. 2004. "Fast food, race/ethnicity, and income: A Geographic Analysis.” American Journal of Preventive Medicine 27:211-217. Hellig, A., & Sawicki, D. S. (2003). Race and residential accessibility to shopping and services. Housing Policy Debate, 14(1 and 2), 69-101. Kwate, N. O. A., Yau, C. Y., Loh, J. M., & Williams, D. (2009). 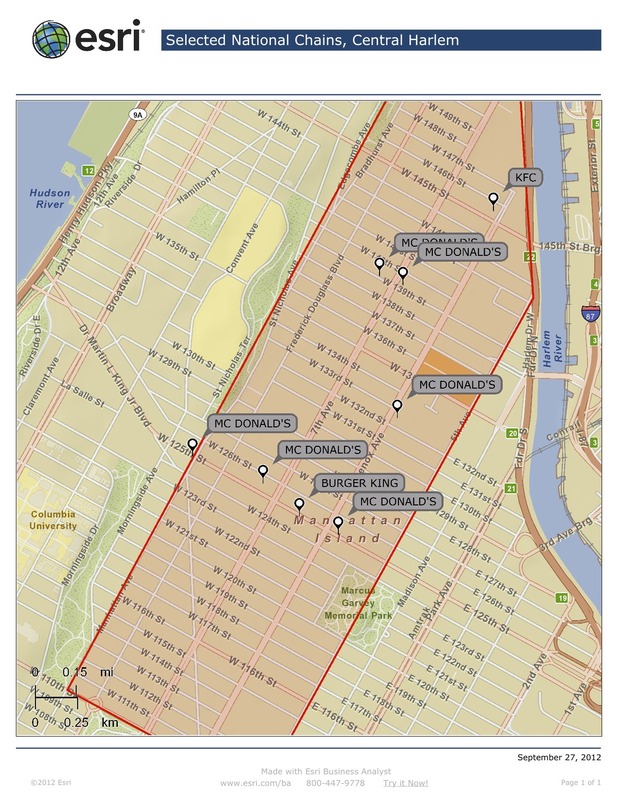 Inequality in obesigenic environments: Fast food density in New York City. Health & Place, 15(364-373). Lewis, L.B., Sloane, D.C., Nascimento, L.N., Diamant, A., Guinyard, J.J., Yancey, A.K., Flynn, G., & REACH Coalition of African Americans Building A Legacy Of Health Project. 2005. African Americans’ Access to Healthy Food Options in South Los Angeles Restaurants. American Journal of Public Health 95, 668-673. Moore, L. V., Diez Roux, A. V., Nettleton, J. A., Jacobs, D. R., & Franco, M. (2009). Fast-food consumption, diet quality, and neighborhood exposure to fast food: The Multi-Ethnic Study of Atherosclerosis. American Journal of Epidemiology, 170, 29-39. Walker, R.E., Keane, C.R., & Burke, J.G. (2010). Disparities and access to healthy food in the United States: A review of food deserts literature. Health & Place, 16, 876–884. Meltzer, R., & Schuetz, J. (2011, online first). Bodegas or bagel shops? Neighborhood differences in retail and household services. Economic Development Quarterly, DOI: 10.1177/0891242411430328. Small, M. L., & McDermott, M. (2006). The presence of organizational resources in poor urban neighborhoods: An analysis of average and contextual effects. Social Forces, 84(3), 1697-1724. Gordon C, Ghai N, Purciel M, Talwalkar A, Goodman A. (2007). Eating Well in Harlem: How Available Is Healthy Food? New York, NY: New York City Department of Health and Mental Hygiene. Weems, R.E. (2009). African American consumers since World War II. In: African American Urban History Since World War II. K.L. Kusmer & J.W. Trotter, (Eds.). Chicago: University of Chicago Press.